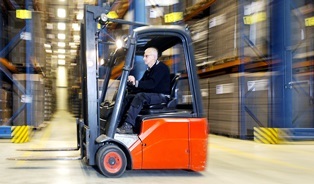 Forklifts are common tools used at warehouses, distribution centers, and construction sites in Ohio. Workers at UPS, Anheuser Bush, and Walmart may have to drive forklifts as part of their job duties. However, unsafe workplace conditions and insufficient training can lead to a forklift accident that injures the driver or a nearby worker. According to the Occupational Safety and Health Administration (OSHA), there are nearly 100,000 workplace forklift injuries reported across the U.S. each year. If you're injured in an on-the-job forklift accident that leaves you unable to work, you may collect workers’ comp benefits to cover your medical expenses and lost wages. You may need a lawyer to help protect those rights. While a forklift's front wheels help support cargo, rear wheels propel the machine. This rear steering often makes it difficult for an operator to stop suddenly or maneuver in tight spaces. Also, an operator may not have a clear sight line of hazards in front of him because of width or height of the load. And drivers are often insufficiently-trained, or forklifts may be poorly-maintained or defective. Forklift turnover. Nearly a quarter of all forklift accidents are turnover accidents. Uneven terrain, an unbalanced or heavy cargo, and reckless driving can all cause a forklift to flip over, injuring the driver and anyone standing nearby. Struck by a forklift. A careless coworker driving a forklift could fail to see you in his path or could slip off the brake as you're loading the forklift, causing crush injuries. Falling material. When a load isn't properly secured on a forklift, it can fall off and land on a person working nearby. These materials are likely heavy and can cause significant head, back, and chest damage. When you were injured by a forklift on the job, you reported your injury and got medical attention. You filed your claim with the Ohio Bureau of Workers’ Compensation (BWC) and were shocked to be denied. You trusted your employer to provide the coverage you're entitled to, not to dispute whether the injury happened at work or not. Despite your shock, it’s important that you take swift action. Download my free ebook, The Worker’s Guide to Injury Compensation in Ohio and call me, an experienced Ohio workers’ comp attorney, right now to find out how we can help with an appeal. We assist hundreds of workers every year in Ohio by giving their cases the personal attention they deserve. Reach out to us today.